The planets orbit a red dwarf star at least 500 million years old, in the constellation of Aquarius. They were discovered in late 2015 through a series of observations by the TRAnsiting Planets and PlanetesImals Small Telescope (TRAPPIST), a Belgian robotic telescope located at ESA’s (European Space Agency’s) La Silla Observatory in Chile. TRAPPIST-1b completes a circuit around its red dwarf star in 1.5 days and TRAPPIST-1c in 2.4 days. The planets are between 20 and 100 times closer to their star than the Earth is to the sun. Because their star is so much fainter than our sun, researchers think that at least one of the planets, TRAPPIST-1c, may be within the star’s habitable zone, where moderate temperatures could allow for liquid water to pool. On May 4, astronomers took advantage of a rare simultaneous transit, when both planets crossed the face of their star within minutes of each other, to measure starlight as it filtered through any existing atmosphere. 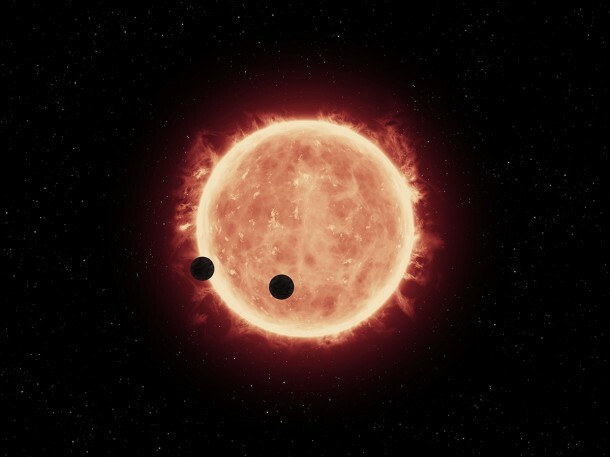 This double-transit, which occurs only every two years, provided a combined signal that offered simultaneous indicators of the atmospheric characters of the planets.